Next week, the commander of U.S. forces in Iraq Gen. David Petraeus and U.S. Ambassador to Iraq Ryan Crocker will deliver the much-anticipated report on the status of the “surge” operations that have been ongoing since earlier in the year. The report will be no surprise. It will say the military operations are starting to turn to the tide against al-Qaida, there is moderate political progress with some Sunni tribes, the Iraqi security forces are only slowly getting up to speed, and the Iraqi government still has major problems. I suspect that no matter what the ambassador and the general have to say, it will make no difference. Those who favor the immediate withdrawal of American forces will try again to legislate an end to the war pretty much as they did in 1975 in Vietnam. The difference is that in Vietnam we cut off funding to the Vietnamese whereas here we are talking about cutting off funds to our own troops. In Vietnam we declared victory, withdrew our forces, and left the Vietnamese to fend for themselves. It was an act which led to millions of deaths in Southeast Asia. Now, too many of our elected representatives are perfectly willing to declare defeat and leave Iraq. Yes, I know the rhetoric; we are leaving Iraq, but not the region that is so vital to our national interests. If you do not believe the Persian Gulf is vital to America’s national interests, I have one word for you: oil. They have it and we — along with the rest of the world — need it. Despite the fact that the United States imports less than 20 percent of our oil from the Gulf region, oil is probably the ultimate fungible commodity. It does not matter where your oil comes from, it only matters how much is available on the world market. Take off the table the 25 percent of the world’s oil that flows from the Persian Gulf every day and the countries that rely on Gulf oil for the majority of their energy like Japan, China and India who will be bidding to buy oil from our suppliers and the price will skyrocket. We will not leave the Gulf. It has been our national policy to guarantee the flow of Persian Gulf oil with military force if necessary since President Carter first stated it in 1980. Yet we are willing to watch Iraq, who has the world’s second largest proved reserve, descend into a Sunni-Shia bloodbath, or become the next al-Qaida stronghold, or both. The probability of al-Qaida achieving a victory in what they themselves have designated the primary battlefield in their jihad against the West is becoming less likely due to the recent success of military operations combined with cooperation from the tribal shaykhs in al-Anbar governorate. 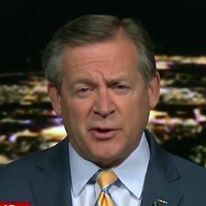 Of course, that assessment only holds true as long as there is sufficient U.S. military force on the ground to continue aggressive operations against the group, a military presence that will need to remain until the Iraqis are capable of doing it for themselves. How long will that be? I doubt General Petraeus knows yet, but for sure no one in Congress does. American forces have been in Iraq since March 2003 — far too long. We all agree that this war should have been over long ago. Whether you supported the invasion or not, once the troops were deployed, we owe it to them to conduct this war aggressively, efficiently and quickly. After the fall of Baghdad and until the surge operations of earlier this year, we did none of the above. It appears that the leadership in Washingtonm, either at the White House or the Pentagon, has finally figured it out and committed the right combination of commanders and resources to conduct the war effectively. I fear it may be too little too late. What the commanders on the ground in Iraq need now is time, the one resource Congress will not provide. 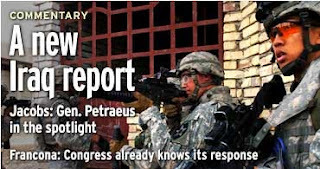 The Crocker-Petraeus report will be delivered next week, but the Congressional responses to that report have already been written. We could have and should have won this one.